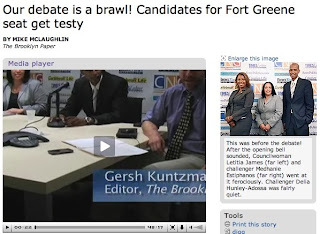 While the Brooklyn Paper’s coverage (headlined Our debate is a brawl! Candidates for Fort Greene seat get testy) of the 35th Council District debate focused on the clash between Council Member Letitia James and longshot challenger Medhanie Estiphanos, perhaps the real news came from watching challenger (and Atlantic Yards supporter) Delia Hunley-Adossa, who currently leads AY opponent James in cash on hand, in action. Now we know why Hunley-Adossa has been so inaccessible. She relies on platitudes and her speaking style is peppered with malapropisms. Yes, people speaking extemporaneously shouldn’t be expected to speak perfectly, but Hunley-Adossa was well below the bar for political candidates. James spent most of her time clashing with Estiphanos, an energetic neophyte who lobbed criticisms both off-base and cogent, leaving Hunley-Adossa mostly unscathed--not a wise tactic for the incumbent. The toughest questions for Hunley-Adossa came from Brooklyn Paper staffers, and she didn’t handle them too well. Hunley-Adossa said she’d “bring in inclusion” and referenced the need for both affordable housing and economic development--either generic buzzwords or code words for Atlantic Yards. Moderator Gersh Kuntzman, editor of the Brooklyn Paper, asked if she thought James hasn’t been good on affordable housing or working class issues. Hunley-Adossa said she’d “just state the facts,” that there’s been more luxury housing and condominiums built in the district than affordable housing. “Is that a function of what the Councilwoman has or has not done?” Kuntzman asked. “She is the Councilperson,” Hunley-Adossa said. “But is it a function of something she did or did not do properly?” Kuntzman followed up. “Part and partial to that,” Hunley-Adossa responded. This doesn’t make sense. Does Hunley-Adossa have an operator screening her calls? If she gets a message on her personal phone, she can always write it down and take it to her office. That’s not so. The New York Times blog The Local spoke to her campaign manager, who did not put her through to the reporter. Both James and Estiphanos said they were more accessible. Hunley-Adossa pledged to have a 24-hour cell phone once elected. Estiphanos led the charge against the Fulton Street Business Improvement District (BID), saying that property owners, rather than merchants, supported it. James corrected Estiphanos, who said there was a BID on Washington Avenue; rather, there’s a merchants’ association. She said businesses were consulted, and a $300,000 fund has been created to help those who can’t afford the assessment. Asked what’s wrong with Atlantic Yards, James said she’s against the current version because now the emphasis is on the arena and arena alone, while she favors building affordable housing, not building an arena. James went on to criticize “a giant superblock, 16 skyscrapers in a brownstone community.” (Actually, two sides would border a brownstone community, while the others would be at major arteries, one of which is opposite a brownstone community, one not.) She cited abuse of eminent domain and displacement. At 17:57, Kuntzman asked Hunley-Adossa why she supported it. This is an interesting gambit. Atlantic Yards is not the same as the Downtown Brooklyn plan. First, the latter is clearly in Downtown Brooklyn, while the former is in Prospect Heights. AY is essentially a privately-negotiated rezoning, with affordable housing used by developer Forest City Ratner to achieve the density it wants. And, perhaps most importantly, the Downtown Brooklyn rezoning was announced by the city as an effort to increase office space and thus jobs; the construction of condos was an unforeseen consequence. While some AY opponents criticized the scale of the rezoning, nobody--including long-time affordable housing advocates like ACORN, or Hunley-Adossa--criticized the rezoning for not addressing affordable housing. Estiphanos, aiming for a middle ground, criticized James for “demonizing” project proponents like Mayor Mike Bloomberg, Governor David Paterson, and developer Bruce Ratner, and said she’s lost credibility to negotiate. However, Estiphanos apparently hasn’t listened to Bloomberg demonize AY opponents or Ratner’s allies, such as construction unions, shout down or otherwise interfere with public hearings. James pointed out that she supported an alternative, the UNITY Plan, and “my opposition”--presumably Estiphanos--contacted AY opponents to learn about it. “As you know, Downtown Brooklyn was split between two councilmanic districts,” James responded. “So I had to respect Council Member David Yassky who supported one side of Flatbush Avenue and decided what was best for his district.” She said she’d negotiated affordable housing for the part of the rezoning in her district on Myrtle Avenue, but it had not yet come to fruition. At about 21:28, Kuntzman asked Hunley-Adossa how much FCR contributes to Brooklyn Endeavor Experience (BEE), the Community Benefits Agreement signatory she heads. “When we negotiated the CBA, we had negotiated for a two-year budget, which is a little over a couple of hundred thousand dollars, that would last us through,” Hunley-Adossa said. “That would be for our overhead, office space, it’s all in the CBA. Salaries and different things--and it’s written in the CBA." If requested by the Environmental Assurances Committee, the Developers shall work with FATHC to seek and secure public and/or private funding to pay the reasonable expenses of the working group of this committee, in order to provide: an appropriate meeting space within walking distance of the Project, postage and phone communications, webhosting services for a community webpage and message board dedicated to the Project, and the services of an administrative staff to update the community webpage on a regular basis. Take a look at BEE’s web site for the lack of updates. Kuntzman asked if that money has been made available? Hunley-Adossa said yes. According to a 2007 Form 990 report to the Internal Revenue Service, BEE gained $173,000 in contributions. No 2008 Form 990 has yet been made available, so we don’t know if additional contributions have been received, but if it’s “a little over a couple hundred thousand dollars,” there must have been more. Note that FCR executive MaryAnne Gilmartin said in July that “Forest City has funding obligations and commitments to each of the organizations, and they’re reviewed on an annual basis.” That leaves room for additional funding. More importantly, experts on CBAs say signatories are not supposed to take money from the developers they negotiate with. And Mayor Mike Bloomberg, an enthusiastic witness to the AY CBA, now calls CBAs "extortion." "What does Brooklyn Endeavor Experience do,” Kuntzman asked. What? The project wound up essentially the same square footage as originally announced. The developer increased the size and then took it down. Hunley-Adossa’s written testimony at the hearing on the Draft Environmental Impact Statement had nothing to do with downsizing. “We also negotiated that it would have LEED [Leadership in Energy and Environmental Design] standards,” Hunley-Adossa continued. Her group is supposedly an environmental group. She should be asked about her expertise in this area; there’s no sign of it. “We negotiated that they would have like, specific--using low fossil fuels, things of that nature, worried about the particulate matter, the rat and rodent abatement, blah blah blah,” she said. It is understood that the Project’s environmental impact statement and review process is administered by the State. All potential environmental mitigation measures, the cost to implement such measures, and the party deemed responsible for their compliance is ultimately determined by the State. Therefore, the Developer shall be in compliance with this Agreement by following the state mandated process. While typically people pronounce the latter F-E-I-S, using the individual letters of the acronym, Hunley-Adossa pronounced it “FEES,” showing her unfamiliarity with the issue. “After that, what Brooklyn Endeavor has attempted and is attempting to do, is to educate young people on how to be little green people. So, we have classes, biweekly, with youths,” she said. “Where are those classes?” Kuntzman asked. “Was that because there’s no additional money from the CBA coming?” Kuntzman asked. Kuntzman left it there, but the issue’s actually murky. It hasn’t been six years. The group wasn't incorporated until 2005 and it wasn’t doing much at the time. According to a 2007 Form 990 report to the Internal Revenue Service, BEE gained $173,000 in contributions and distributed $37,878 in program services and $61,473 on management and other general expenses. That included $51,447 in compensation for Hunley-Adossa. No 2008 report has been filed yet and it’s unclear what the nearly $74,000 left over has been spent. Hunley-Adossa was not asked about her expertise in this field or why the board consists of friends and relations. McLaughlin asked James how the can the public can trust her to be a good steward after the mini-scandal of nonpayment of taxes. She said it was her family’s personal property. McLaughlin said she paid only after media reports. It's less weighty than Hunley-Adossa's ties to a developer, but her dismissal of her obligation and the initial criticism was tone-deaf. Estiphanos brought up fines posed against James’s previous campaign by the Campaign Finance Board. The bottom line is that the rezoning permits towers south of Surf Avenue in the amusement district. While James didn’t have a full-blown plan for Coney, a 1/23/04 Bergen Record article quotes Letitia James as suggesting that the arena be moved to Coney Island or the Navy Yard, where eminent domain wouldn’t be abused. “I’m also a former teacher,” Estiphanos responded. “And you’re responsible for the decline in the economy,” she continued in an overblown accusation, charging that he’s running for Council because he’s unemployed. Kuntzman asked about mayoral control of schools. Both Estiphanos and Hunley-Adossa said it should be tweaked. “Mend it, don’t end it,” James added. Are schools better? Estiphanos said there was a marginal improvement in graduation rates, but not commensurate with the spending. Kuntzman asked if the candidates supported charter schools and vouchers. James said she opposed vouchers, but supported public charter schools. Estiphanos said he supported vouchers. Estiphanos pointed out that, in a recent hearing held by the Council Education Committee, members were fed questions by the UFT. The candidates were given an opportunity ask each other questions. At about 40:30, Hunley-Adossa read a long, loaded question--with Kuntzman intervening twice to ask her to get to the point--about why, if James cared for the community as she professes, she supported various condos and the non-union jobs behind them. “Well, they’re part of the Downtown [rezoning],” Hunley-Adossa tried to say. Actually, several are not. Um, Ratner is not an officeholder. Estiphanos pointed out that she compared Bloomberg to Ugandan dictator Idi Amin and asked, “how does that help the community”? James said she took issue with that. Estiphanos said he had the video on his web site. “I don’t know if I ever referred to Mayor Bloomberg as Idi Amin,” James said. That characterization, she could’ve argued, is within the bounds of political discourse, given Bloomberg's steamrolling of term limits. James then went after Estiphanos, asking why he’d last voted in 2004. What exact expertise she has is unclear. She didn’t even mention her longtime role heading the 88th District Precinct Council. James cited her record and accessibility. Echoing Hunley-Adossa, he said candidates should be focused on affordable housing. If so, perhaps before the next debate they can do some research. Delia Hunley-Adossa is a charlatan who should be doing something else other than wasting people's time. She reminds me of Detroit's Monica Conyers. To quote the eloquent Ms. Hunley-Adossa, "blah blah blah." Only 18 more days and we don't have to listen to this silly candidate any more. Time and time again you continue to show your one sided views, which are in favor of the INCUMBANT. Each time I laugh harder, and attempt to figure out how it is that you benefit from your one-sided views. No, I'm not a reporter, but i am a loooooooonng time community member. Stop being one-sided Mr. Newman. Just report the news!!!! Ms. James has alot more negatives that you know of, but are SCARED to report.... That goes for Mr. Oder as well. You are all linked!!!!! Just in case you forgot, "THE STREETS ARE ALWAYS WATCHING"
Make sure your wearing your seat belts this is going to be a wild ride!!!!!!! I'm posting the comment from StreetGod4 though it was aimed at The Local, not my coverage. There's no evidence that Letitia James--the incumbent, to help StreetGod with spelling--has any control over Andy Newman, and that's an unfair accusation. James surely has some negatives--and people unafraid to use their names should be willing to come forward. But is it "one-sided" to point out that Delia Hunley-Adossa did not do well in the debate? Nope. Watch the video. Just to be clear, Andy Newman's been at the Times since 1997. Letitia James has been on City Council since 2003. And she's not responsible for hiring at any newspaper. Delia Hunley-Adossa has failed to make herself accessible to the voters, when she does speak out it is in slander towards opponents! I cannot be won over by a game of false accusations, I want to have a leader who focuses on the community when speaking out and what they can do for it like Tish James. It only shows desperation on Delias part which should have no place in office. Between this and youths pulling down posters, my vote is now firmly place with Tish James, who whilst in office has shown that she can make a difference and better the area we live in and she doesn't need to be rude and unprofessional to do so!